The Houston Astros own the best record in the majors, and that isn't exactly surprising. 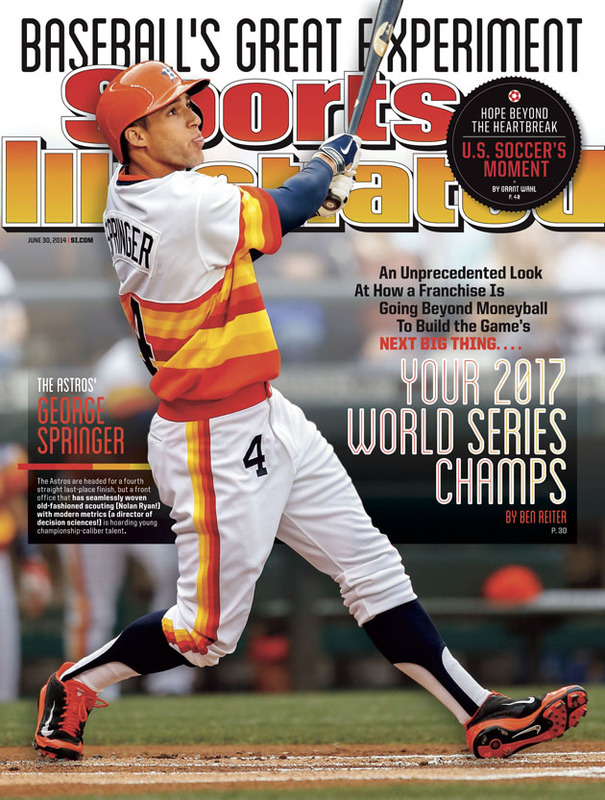 After all, that infamous Sports Illustrated cover in 2014 declared them your 2017 World Series champs. After earning a wild card in 2015 and losing a tough division series in five games to the Kansas City Royals, the Astros were unable to overcome a slow start in 2016, and they finished 84-78. That lack of improvement led to questions about how good the 2017 team could be, and the Astros entered the season more or less as co-division favorites with the Texas Rangers. "The team we have now is head and shoulders above what we had in 2015," pitcher Dallas Keuchel told reporters in late April. "I think we played out of our minds in '15, and it kind of showed in '16. We actually weren't that good, to be honest. We kind of played the hide-and-seek method, and nobody could find us. This year, we're pretty good, and we know that going in. And that's why we're so confident each and every night we play. That just makes it even more fun." If Keuchel was having fun on April 30, imagine how he feels now. The Astros entered Tuesday riding an 11-game winning streak and were on pace for 117 wins, which would set a single-season record. Hey, we told you back in the first week of the season that the Astros were the most fun-to-watch team in baseball. OK, they blew a 7-1 lead to the Royals, lost on a ninth-inning walk-off home run Tuesday and now are on pace for just 115 wins, but that's still fun! He replaced Colby Rasmus, a good-fielding but strikeout-prone outfielder, with Josh Reddick, a good-fielding outfielder who has become one of the better contact hitters in the league. Astros DHs fanned 166 times in 2016, third-most in the AL. Luhnow signed Carlos Beltran, a better contact hitter (though his strikeout rate is up from 2016). Astros catchers fanned 181 times in 615 plate appearances in 2016. Luhnow traded for Brian McCann, who fanned 99 times in 492 PAs. The Astros claimed Norichika Aoki, a contact hitter, on waivers from Seattle. Among the holdovers, Evan Gattis has cut his K rate from 25.5 percent to 14.4 percent, and Carlos Correa has slightly decreased his rate as well. This has helped turn the Astros from a middle-of-the-pack offensive team to the best in the AL. They are scoring more than a run per game more than they did last season. The Astros have three of the best in the majors in Jose Altuve, Correa and George Springer. Of our super teams, only the 2001 Mariners had more top-two positions players in Bret Boone, Mike Cameron, Ichiro Suzuki and Edgar Martinez. Boone, Cameron and Suzuki were all superlative defenders. Houston's two weakest positions are still average -- Yuli Gurriel at first base and Bregman -- and both players have been hitting better after slow starts. Marwin Gonzalez's hot start has helped prop up the overall ranking for left field, where he has been playing a lot as of late, sharing time with Aoki. Heading into the season, this was a concern, given that Keuchel and Lance McCullers were both coming off injuries. Both have pitched like All-Stars, however, with Keuchel 9-0 with a 1.67 ERA and McCullers 6-1 with a 2.72 ERA. They rank fourth and sixth in the AL in FanGraphs WAR and first and 15th in Baseball-Reference WAR. The rest of the rotation hasn't been as strong, with Mike Fiers, Charlie Morton and Joe Musgrove sporting ERAs over 4.00. What's more, Morton and Musgrove are currently on the DL with minor injuries, and that has led to some spot starts for Brad Peacock and David Paulino. Fiers is the biggest red flag, as he has surrendered 18 home runs in 57.2 innings and owns a 6.52 FIP. If the Astros make a trade, it would probably be to add a starter who can step in as the No. 3 guy in the rotation. You see the point: All these rotations remained healthy. For the Astros to keep up this pace, they'll need Keuchel and McCullers to make 30 starts, they'll need to get Morton and Musgrove back soon ... and they might need to make a deal in July. As we saw Tuesday with Ken Giles, this group has had a couple hiccups, though it was just Giles' second blown save. Luke Gregerson, so good in recent seasons, has a 5.32 ERA. Still, the depth here is impressive. Chris Devenski has become a valuable multi-inning reliever and could become a rotation candidate if the Astros want to stretch him out. Entering Tuesday, Devenski had 51 K's in 33.2 innings, Michael Feliz had 35 in 25.2 innings, Will Harris had 27 K's and three walks in 24.1 innings, and even James Hoyt, who is like the No. 6 reliever, had 31 K's and four walks in 17.2 innings. Given those numbers, it's no surprise that the Astros lead all bullpens in strikeout rate. They rank fifth in batting average against, fourth in OBP allowed and seventh in strand rate. If you want to nitpick, Tony Sipp is the only lefty, and Giles doesn't match up with the top tier of closers. Still, it's a good pen and, Tuesday's result aside, one that won't blow too many late-game leads. The biggest question is whether Giles is the guy to close a one-run game in October, and we won't know that answer until we get there. We knew the Astros were going to be fun to watch. Now we know they're good -- and potentially a team for the ages. Their awe-inspiring pace should make for an exciting summer in Houston.